In the Taoist view, simplicity and patience go hand in hand with compassion. Simplicity is extremely important in Taoist philiosophy in that complex actions generally are destructive and can upset the so called natural balance of the universe by imparting too much intellectual yang structure into a persons actions. Acting in simplicity allows for one to lead a more harmonious life without having to deal with complex social constructs that can arise from living in that complexity. The more simplistic an action, the truer that action can be from that individual. Patience is also key in Tao Philosophy in that the lack of patience is caused by wants, of which those that are frivilous are considered unhealthy and again upset a natural balance, Such as greed versus a general populace. To have patience is to act by in-action. By this less action against nature is required to attain ones goals and objectives. Compassion as aforementioned goes hand in hand with simplicity and patience. Love, as an alternative translation to compassion is simplistic in itself and often requires much patience with that in which one has compassion for. 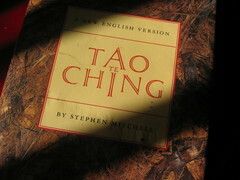 A key taoist belief is that all things stem from the same source, this being the Tao itself. As such, to have compassion for all is akin to having compassion for yourself, your loved ones as well as the earth and or universe itself. Therefore these "Jewels of the Tao" have become major tenants to grasping that to which Lao Tzu claimed to be impossible to understand for it to be the truth.